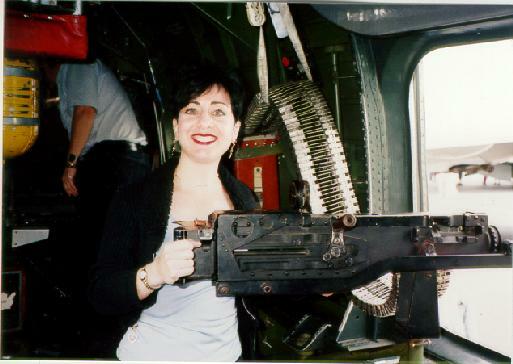 On Sunday, May 10, 1998, Cathy and I went to Burbank Airport for an airshow. The featured attractions were a pair of restored bombers from World War II. 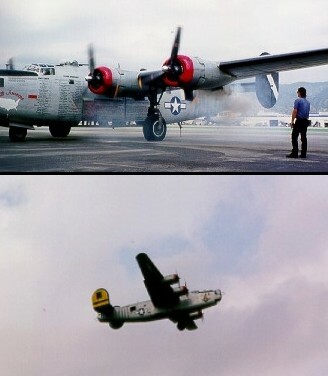 One B-24 Liberator and one B-17 Flying Fortress. The B-24 was a plane that actually had flown in combat in the Pacific near the end of the war. 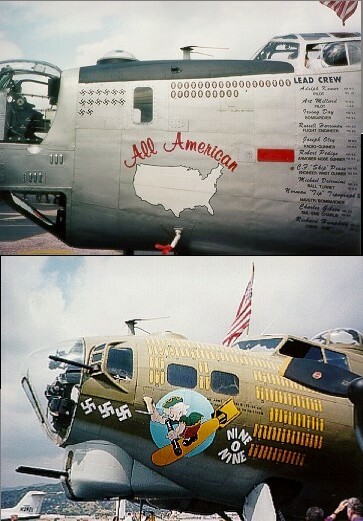 Here, it was restored to represent the "All American", which flew 28 missions with the U.S. 15th Air Force, 461st Bomb Group before being shot down over Europe in 1944. The B-17 was one that had rolled off the assembly line at Douglas Aircraft in Long Beach just before the end of the war. It never saw combat, but it did end up being used in several nuclear tests in Nevada, as well as carrying boats for air-sea rescue in the Pacific. Here, it was restored as the "Nine-O-Nine", which flew 140 missions with the 91st Bomb Group, 323rd Squadron stationed in England between April, 1945 and the end of the war. We got to walk through (or perhaps scramble might more properly describe the experience) both planes. It was very cramped inside, much like a submarine. Each plane carried a crew of ten. A pilot and co-pilot, bombardier, radio operator, and six gunners to defend the plane from enemy fighters. The guns were 50 caliber machine guns. The flyers who were there told us that their flight helmets helped to protect them, but that the noise in the plane was still horrific when all the guns were blazing away. 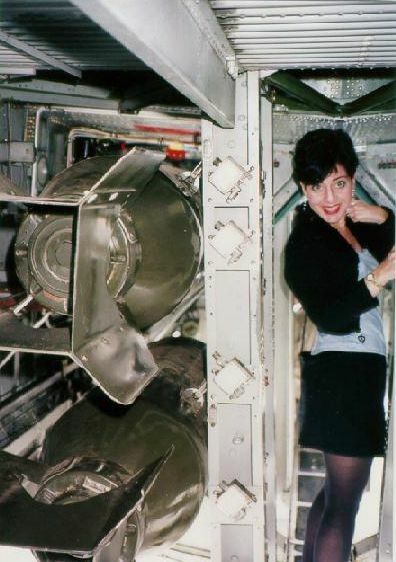 Here's Cathy in the bomb bay, and as a waist-gunner in the B-24. The highlight of the day came at the end, when we got to see the B-24 fly. They were offering rides in both planes for $300 per person. We would have liked to have done it, but the price was a bit steep for our budget. Still, just getting the chance to see the plane flying was an amazing thing. They fired up the four big engines on the B-24, and the plane taxied away to the far end of the runway. After a few minutes wait for the runway to clear, we heard the roar of the the propellers as the plane rolled down the runway towards us. By the time it reached us, it was already in the air, slowly lumbering its way up into the sky. We have grown up seeing jets fly, so the B-24 looked like it was moving impossibly slowly by comparison. Still, it was an impressive sight, and it must have been amazing to see the sky darkened by hundreds of these planes during the war. There were several veterans of the war there, and they were happy to tell us their stories of flying these planes in combat. Their missions were all over Europe, and lasted on the order of 12 to 16 hours at a stretch, which they described as mostly excruciating boredom with some moments of sheer terror. We spoke at length with Lt. Al Garduno from San Gabriel. He told us stories of flying as the pilot of a B-24 in North Africa and Italy, including some of the famous raids on the Ploesti oil fields in Romania. The Germans defended these fields with more antiaircraft batteries than any place except Berlin, and the bombers took heavy casualties on every mission. On one of Al's missions, his plane was damaged to the point that they had to make an emergency belly landing on an Italian airfield that was still under German control. His crew was ready to fight it out with the Germans, but he thought that the odds were too much against them and ordered them to surrender to stay alive. This turned out to be a wise move. It was only after they landed that they learned that the field had been taken by the British the day before, so they narrowly escaped becoming prisoners of war. He showed us pictures from the hospital after the crash, and during his recovery. The normal tour of duty for bomber pilots was 25 missions, but by the time he had recovered enough to return to duty, the war had ended, so his tour ended at 12 missions. We very much enjoyed speaking with Lt. Garduno, as it is hearing the stories of people who were actually there that really makes history come alive. 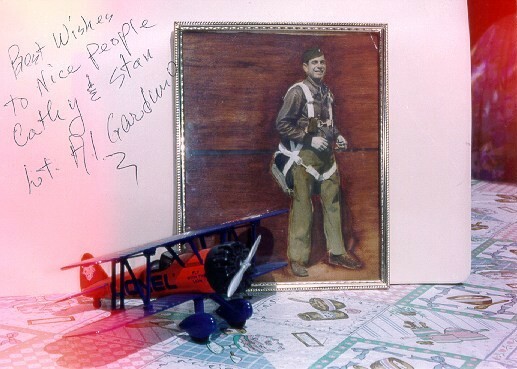 He even gave us a picture to remember him by. Our hats are off to him and all the others who flew these planes. They also have a web page at http://www.b-17combatcrewmen.org. I recently found out that my friend Susan's father flew on a B-24 in the war. She is building a page about his experiences. It can be found at http://www.bombslullaby.org.